(Spokane, Wash.) — Can’t wait for Inlander Restaurant Week? You don’t have to! 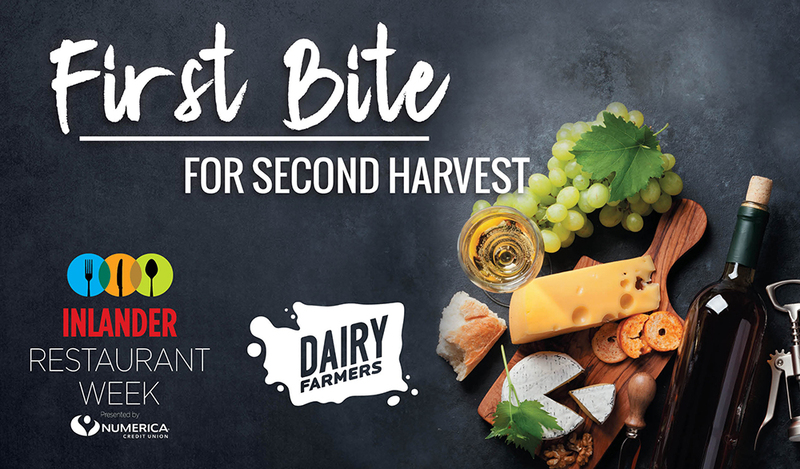 Diners will have their first chance to sample some of the menu items featured during the highly anticipated annual event at First Bite for Second Harvest, presented by Dairy Farmers of Washington. The second-annual fundraiser will be held Feb. 1 at Barrister Winery from 6-8 pm. Eight Inlander Restaurant Week eateries will provide a taste of one of their courses at the event. The evening will also feature artisan cheese from Washington State creameries, and Washington wine from Barrister. Tickets are on sale now at InlanderRestaurantWeek.com for $31 — the same price as the three-course, prix fixe Inlander Restaurant Week meals. All of the proceeds from the event will go directly to Second Harvest in support of its mission to provide healthy food to those who need it most in the Inland Northwest. Participating restaurants include: Bonefish Grill, Casper Fry, Durkin’s, Fleur de Sel, Gilded Unicorn, Mackenzie River Pizza Co., Tamarack Public House and The Davenport Hotel’s Safari Room. First Bite for Second Harvest also serves as the official kick-off to Inlander Restaurant Week. All of the 107 participating restaurants’ menus will be revealed at the event, and guests will be the first to receive the official printed guide. Inlander Restaurant Week takes place Feb. 22-March 3. Participating restaurants will provide three course meals at the set price of $21 or $31 during the 10-day eating extravaganza. Second Harvest is the leading hunger-relief network in the region since 1971. Second Harvest distributes more than 2 million pounds of food at no cost each month to help people in need in 26 counties in Eastern Washington and North Idaho. Partnerships with more than 250 neighborhood food banks and meal centers, along with food distributions at nearly 500 Mobile Markets a year, make it possible to feed 55,000 people each week. The Dairy Farmers of Washington (Washington Dairy Products Commission) was created by an act of the Washington state legislature in 1939. Its mission is to promote dairy products within Washington state and to educate the public about dairy products and the dairy industry. The Washington Dairy Products Commission conducts year-round advertising, public relations programs, promotions, issues management initiatives, industry communications and public education campaigns directed mainly toward consumers. These activities explain the nutritional benefits of including dairy products in the diet; underline dairy foods’ status as one of the most heavily tested, closely monitored and safest food products available; and communicate the dairy industry’s contributions to the state’s economic development.